Atra Vetosus are a Tasmanian band that are on Immortal Frost’s roster for a couple of years. In 2011 this collaboration resulted in the release of the demonstrational recording A Palace Shrouded In Emptiness (the tracks from that demo, by the way, have been re-arranged for this debut full length) (back then, by the way, Atra Vetosus were a duo, i.e. Josh Young aka Slikver, and Josh Gee aka Thorodan), and Astral Winter’s Perdition-album was released in co-operation in between both of them as well. Why do I mention this project? Astral Winter is a solo-outfit by Josh Young, founding member and guitarist / vocalist of Atra Vetosus. And for your information: you can read the review on that album done by undersigned on this site; check out the update on July 20th 2014. Nice too is to know that Josh and Immortal Frost’s owner Surtur started a new project, Hammerstorm, with a first album out on Obscure Abhorrence in late autumn 2013; I hope to enjoy a next aural result of this collaboration very soon, of course. Anyway, Voices From The Eternal Night was recorded by Josh Y. (who also took care of mix and mastering, who wrote all music, and who performed the additional keyboards as well; everything, by the way, was conceived at his own Dawnless Studio), Josh G. (lead vocals and lyrics), Josef Bound (drums), Damon parker (guitar), and Matthew Lopez (bass). 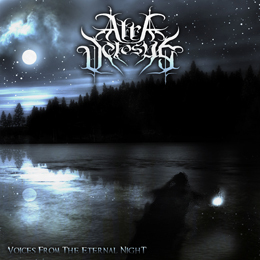 The album, which has a total running time of fifty minutes, brings a highly melodic and atmospheric form of Black Metal, rather fast-paced, but not of the aggressively-blasting kind. It withholds a certain catchiness (not of the poppy current, believe me), somewhat in the vein of the earliest Naglfar-, Catamenia-, Sacramentum- and Dissection-efforts, including that very same persuasion and creativity in song structures. It comes with some excellent, almost refreshing keyboard lines, some great harmonious chants (even I have to admit that these clean vocals are a surplus! ), atmospheric acoustic guitar parts, and so on; that is to say, not that original, maybe little predictable or ‘evident’ from time to time, but in general of a very, very high performance quality. I want to come back on the keyboards, for these are both supportive (atmospheric, dreamlike, ambient) and prominent (symphonic, bombastic, or piano-sounding like as introduction to Tortured By The Light Of A Thousand Stars). They are of a non-deniable importance to define Atra Vetosus’ material. With Into the Dawnless Night, the album has its necessary acoustic intermezzo (another proof of predictability, but once again in a non-irritating manner). But acoustic and / or ambient intermezzi manifest more than once, and that’s a good thing in order to keep the whole experience diverse and absorbing.